Tattoo or skin art is so fashionable now that it seems everyone except me has at least one. It is not new, in fact it is an art with a history spanning more then 5,000 years. In Pacific Island culture it was used to signify rank and title within the community. The missionaries who arrived forced the practice to decline but couldn't stamp it out altogether. It has now regained its former status although perhaps now more a combination of both status and fashion. The colours and designs in London (and no doubt many other places) has probably never been so diverse as it is now. Some are definitely more artistic than others. The artists at the Kings Cross Tattoo Parlour are among the best in the city creating some spectacular designs whether traditional or contemporary. It's not art, it's just empty people following like sheep trying to fulfill themselves. Oh I'm so cheery today! You aren't the only one. I'm tattoo free too! That guy has way too many. I have none. 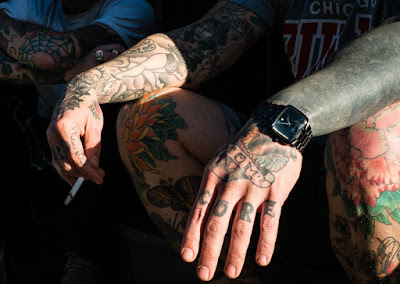 I passed someone today with arms like this- more tattoo than bare skin. I don't get the trend- I would never want to mar my body like that. I don't have any tats, but everyone that I have photographed with tattoos tells me that it is very addictive. Interesting facts and a great picture..
Oh my! that's way too much art for me. Is there a person inside? a great street-pic. No tats here either. I often wonder if they will regret them later on in their lives. I am in good company. Your commenters, you and I all are tattoo-less. I don't see the charm, and unlike a haircut, it is a permanent commitment.